The degree to which people are engaged in planning for their future to that same degree they will be effective when it comes to implementation. This practice is one of the best ways to get at the right questions. From our deserts to our forests, the state of urbanization is a plague upon the vast diversity of the wilderness. For this reason alone, the achievement of high quality urban density is one of the great challenges of our time. Density is a difficult word these days, but it offers a community where people are face-to-face instead of bumper–to-bumper. It suggests a place where people can work and live in the same place, plan for the future of their children and conduct trade in goods and services. The design for dense urban living forms a community that may be of a major culture, language or religion, but its success is built on the capacity to embrace all people from all walks of life because they willing to change and be changed and to be as diverse as the wilderness from which we all came. The main problems defined by planning, design, architecture and engineering describe the need for serving one-hundred million new residents in the United States by 2050. At the same time investors in urban development see weak demand and falling or stagnant wages of ordinary people. So here is one of those right questions? The following is an exquisite description of planning for land use out of CA, the authors wish to share. They are right to do so because it is D-basic. These areas are largely the dry-lands (above in yellow). An interesting part of this assessment involves another question. 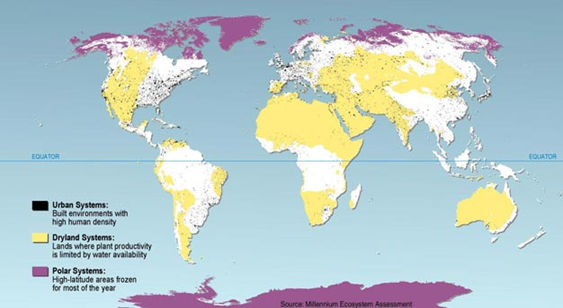 Why urban areas with inland water and/or marine systems could not be included in the analysis because of the, “somewhat arbitrary nature of determining net primary productivity of the system (urban) or population growth (freshwater and marine)”[ii] This puts the link between population and GDP growth in doubt. Nevertheless, it expands the issue on how a refined analysis may help to prove the movement into dry-land areas is a drain on national economies demanding alternative land use initiatives and policies. [i] GDP is the sum of gross value added by resident producers in the economy plus any product taxes and minus any subsidies not included in the value of the products. It is calculated without making deductions for depreciation of fabricated assets or for depletion and degradation of natural resources.